Say hello to Mr. Mustache. That’s what I call him. He was relinquished to Ruby Ranch Horse Rescue and my barn was his first stop. To say he didn’t get out much is an understatement. He’s six and this is his first time away from his mom. With very minimal handling in the past, he isn’t all that attached to people but at the same time, not really wild. He has a lot to teach me. When he first came he seemed extremely distracted. Even after a couple of days to relax, his eye was small and he didn’t care to connect. It was kind of like the thing the popular girls used to do in my high school: Look right through you while scanning the room for someone interesting. Do you know that invisible feeling? Only in this case, he banged his jawbone on my skull in the process. Should I punish him? It’s very rude. One of the best lessons I know about training horses I learned from a puppy back when I was nineteen. She was not house-broken when she came to me and I was patient. I watched and took her into the yard at the right times, I rewarded her for a job well done. She learned fast and didn’t make mistakes. I was some dog trainer, housebroken in just a couple of days. In the evening we took long walks and she always wanted into the yard as soon as we got back home. I didn’t think much of it. After all, it was nice to not have to pick up after her on the stroll. When she was almost two, we headed out for a road trip in my old VW bug. I stopped after a couple of hours, she didn’t need to relieve herself, so off we went. The same thing through the day and by evening she still hadn’t relieved herself and I was really concerned. I could see she was stressed. Did I need to get her to a vet? It might be more important to listen to the conversation in training, rather than just focus on the cue and result. Acknowledge the individual and keep an eye on the big picture. Back to Mr. Mustache. Is his problem a lack of respect for my space? Or is he like most horses, just giving me an honest answer? Maybe what he has learned from people so far is that they are pushy and it makes him anxious to be around us. Yes, he was in my space but as I watched him, he was a bit shut down to humans all the way around. He was resistant to leading, he didn’t want to be touched and his tail was totally off limits. Maybe his problem was the opposite, he had been pushed away too often. I think I have to buy the right to correct a horse. To just march into a pen and start being aggressive shuts horses down, just like getting flipped off by an angry driver in rush hour traffic doesn’t inspire better driving. First I have to establish a relationship. There has to be some shared focus or why should he care about our conversation in the first place? Most weanlings are born with a curiosity about humans that Mr. Mustache seems to have lost. I won’t punish him for that. “The basic techniques, or what they call basics, are more difficult than what comes later, that is the Trap of Dressage. Correct basics are more difficult than piaffe and passage.” -Conrad Schumacher. I love this quote because what we do right now is always more important that what we might do in the future. 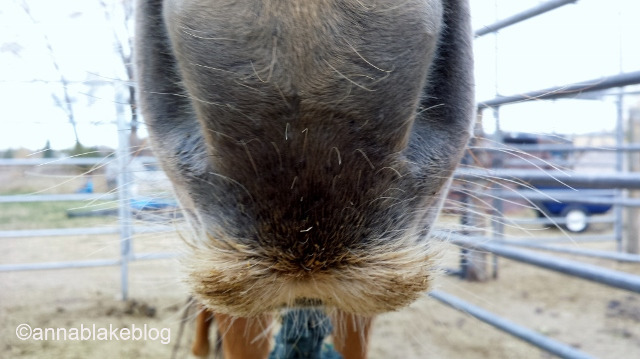 I think Mr. Schumacher was probably referring to forward motion under saddle, but how I translated it to Mr. Mustache was grooming. We started very slow. The curry was too much at first but by the time I finally brushed his tail, we might as well have both been quoting Shakespeare for the elegance of language we had gained. Now his eye is big and soft all the time. He meets me at the gate and by the time I finally put a surcingle on him in the round pen, he could breathe, relax his poll and stand confidently outside of my space. There are as many training methods as there are riders and as many individual answers as there are horses. If a horse doesn’t answer your question correctly, you could always try asking a different question. To yourself and your horse. We live in such a Henry Ford assembly-line cookie-cutter society. It is amazing how people believe that what worked for A will always work for B… Horse training, dog training, human training (been in a public school recently?). Identifying what lesson to teach is just as important as figuring out what/how this INDIVIDUAL will be able to learn it. Every single mind is different. As always – you are brilliant. It is that individuality that makes life better! YES!!! Or the right to touch without permission. I don’t think all horses (or dogs) are as discerning but some have their absolutes. You may touch them with permission (when they’re in the show ring, perhaps, and a judge is allowed…grudgingly…to touch) Otherwise you should wait for permission and not automatically reach out because YOU want to touch the pretty dog. Most don’t mind, but then you meet the ones that absolutely DO mind because they have a mind of their own. And once you are given permission, it’s a wondrous thing. I live with a briard, I agree!! My girl Cookie came home November 16th/13, after a year untouched in a 160 acre pasture…I bought her from a rescue that outbid the meat buyer for her. Before that, she was a broodie who was only ever touched at breeding time. That’s her, in my icon, btw. I have spent every day since she came home gaining her trust. It’s been a long process, and as time goes on, I learn more and more about her previous owners, based on her actions. In the time she’s been here though, she’s gone from a ghost, who we rarely saw, to the first one at the gate to greet me. That’s been achieved by me hanging out in the pasture, and letting her come to me. I use a quiet voice, run my hands over her as much as she can handle, and let her walk off when she needs to. As time has gone on, she walks off less and less, and she only goes a step or two. Now, we’re working on legs and feet. Her hooves are horrible, and she needs them done badly, but she can’t handle other people in her space yet. That’s the goal for this summer, get her feet fully done, without injury to the trimmer, her, or me. She’s curious, smart, and tries to be brave. Sometimes, she gets in her own way, and it frustrates her. But we’re gaining ground, and building trust. At this point, it’s all on her terms. I’m just glad she’s sane. LOL! Great comment. It’s a cross between watching paint dry and running the race of a lifetime! I like your analogy of what happened in training your puppy to use the yard and nowhere else. That was a good lesson to remember – keep the big picture in mind. Would you mind giving a bit more detail other than “starting slow?” If the curry was too much, what did you do instead to get to the point of elegant communication? How long did it take? How did you explore and discover what his limits were and what he responded to? Examples of those details really helps those of us with less experience. Thank you. Well put! I love the image at the end of a horse with a kind, soft eye, which is so much more important than anything fancy that might happen under saddle. BTW, I once trained a dog to sit. At least I thought I did. It turned out that I taught her to sit on a small square purple rug by a doorway. It took me ages to train her that sitting in other places was okay. I love all of your posts and photos and send them on to share with friends. I am stealing your quote about changing the question and posting it in my barn. Thank you. From me and maybe a few horses too. Hmmm…hmmm…thinking your horsemanship through becomes a wonderful habit. Monty, my Haflinger never have a bad day (comparing it to the days of yore &only equitation)…he tries so hard and if something goes amiss I don’t blame him…but,I use my brain now to take my time and figure things out. What fun ! I won’t guess your age, but at MY age the most fun thing is taking the time to do it right. Thank you for commenting. A great read. Treat the horse and take into consideration it’s personality and mood and you will really form a mutual respect that will encourage.